What’s the difference between on premises and cloud-based call center ? This configuration means that your call center’s communication hardware, software, and infrastructure all remain in your offices. The dedicated communication servers can take different forms, PBX or IP PBX. Your team takes care of installation, maintenance, and upkeep in every regard. Everything from your servers to headsets to integration support is controlled internally. Cloud-based call center solutions are, unsurprisingly, hosted in the cloud by a business phone service provider. Users access the service through an app installed on their computer or mobile. This solution relies on internet access with sufficient bandwidth to comfortably accommodate all users. The call center’s data is hosted on the cloud, and the corresponding servers either belong to the service provider, or to third party. Hybrid software means that your call center’s software is hosted off-site and accessed through the internet or intranet. This solution tends to articulate the pros and cons of the previous two models. This solution can represent a good middle ground, but its potential drawbacks are many. It’s cheaper on acquisition than an on premises solution, but still requires third-party maintenance. It’s less flexible than a cloud-based system, more expensive, and less secure. In order to avoid repetition, this guide won’t delve too deeply into hybrid solutions, since they cumulate the characteristics of both on premises and cloud setups. Moreover, the concrete application of a hybrid solution differs for every company. Browser-based software is similar to cloud-based software. Much of the advantages and drawbacks are the same, the main difference is that users access their sessions through their internet browser rather than through an installed app. Cloud-based call center software providers will often provide a browser version of their app, for their users’ convenience. For the sake of brevity, this guide will group browser-based solutions under the umbrella of cloud-based call center software unless otherwise specified. Now that you know which is which, here is comparison of these two solutions’ merits and failings, in ten different areas. On premises: The implementation of an onsite call center can take several months. Buying the necessary hardware, figuring out licensing, setting up the infrastructure, and finding compatible software is no easy task. Cloud: Setting up cloud-based call center software is usually no more difficult that installing an app on a computer. It will function right out of the box, no assembly required. On premises: The cost of an onsite call center can be prohibitively high. You need to purchase hardware (servers, headsets or phone, computers, etc. ), licensing, and make the necessary arrangements to your office space to accommodate it all. Moreover, you must bear in mind the recurring costs of operation. On average, onsite installations must be replaced every five to seven years, due to the hardware aging and the software becoming obsolete. This means heavy fees recurring in the very long run. Cloud: Cloud-based systems function without any investment in hardware or infrastructure, save for a strong internet connection. This is the only preparatory expense for which to plan, since without decent bandwidth, your call center won’t operate properly. As for ongoing costs, users are billed on a monthly subscription basis. This means costs recurring with more frequency, but they won’t be as high. In short, switching to cloud-based call center software means shifting from capital expenditure to operation expenditure: a shorter billing cycle, but lowered costs. On premises: Once installed, onsite call centers setups tend to be difficult to modulate. Adding agents requires purchasing additional hardphones and computers, possibly modifying your hardware. The added costs are one thing, but should you need to scale your activity back down further down the line, that hardware will be a surplus left on your hands. As for mobility, if your agents are working with key phones and linked to a communications server in your offices, they must work from the same desk every day. This means limited geographical location for your agents, and restrictive operating hours for your customers. Cloud: Cloud-based call center software is much more nimble and easy to scale or customize. Adding or removing users is as simple as managing a Netflix subscription. No additional purchases, no extra hardware lying around. This is very handy for call centers with fluctuating seasonal activity. It also allows agents to work remotely. They can access their session from anywhere, given a strong enough internet connection. Having a (partly or wholly) virtual call center can have many advantages for your business, including decreased costs, lower agent turnover, and improved customer satisfaction. On premises: Many businesses are adamant that an onsite call center is the best way to avoid latency or shaky call quality. It’s true that the technology is older and more stable. However, relying on physical hardware can be a weakness in of itself. Your equipment may break down, become incompatible with your software, or be the victim of human negligence. Cloud: On the other hand, your cloud-based call center software is all dematerialized, so you needn’t rely on hardware. Most of the reliability and call quality problems attributed to VoIP aren’t due to failings of the technology itself, but rather to a weak internet connection. Without sufficient bandwidth, packets will get lost, calls will be dropped, and the call quality will suffer. The solution is making sure that your internet link can comfortably support your activity. On premises: The features available are the ones all call centers expect and use daily: transfers, hold, waiting music, conferences, call logging, etc. There is no dearth of functionalities with an on premises call center. However, many of the existing features can be ameliorated with cloud-based software. Live call monitoring: much easier to implement than in a brick-and-mortar setting, and easier to carry out as well. Calls are recorded, stored, and analyzed, and supervisors can access this intelligence from anywhere in order to make data-driven decisions. Smart IVR: IVR enables more precise filtering and routing of calls. VoIP improves on this by adding features such as voice recognition to boost IVR’s efficiency. This way, your agents’ time is better utilized and first-call resolution increases. Click-to-call: A button lets customers also equipped with a VoIP system call your business without having to dial a phone. This lowers your customer effort score, which is an indicator of customer happiness. On premises: Integrating your on premises call center software with other services is possible, but it can be a nightmare of licensing and installation. You will have to rely heavily on your IT team, and the implementation can take a long time. Cloud: Service providers of cloud-based call center software specifically make their product integrate with other services to enhance your customer support. You can easily integrate your CRM system, call script generators, helpdesk tickets, survey templates, and much more with your phone software. This makes for a seamless, intuitive experience for your agents and therefore, a higher quality of support for your customers. On premises: Every call center software model aims to help your agents work as a team. However, there are still partitions between your onsite call center software, and your other utilities. Cloud-based call center software improves upon the functionalities of onsite setups. Cloud: Agents work with a single, integrated dashboard, which increases productivity and the amount of fielded calls. With the enhanced call monitoring afforded to managers by cloud-based technology, they can jump in to help agents with more ease. Likewise, empowered agents are more likely to seek assistance. Virtual call center software also favors reduced agent turnover. Given the costly and time-consuming process of agent recruitment and training, this is a huge boon. Cloud-based call center software can help your business retain its employees and become more customer-central, by involving your entire team in customer success. On premises: An onsite installation relies heavily on its IT team for hardware maintenance, software updates, and general upkeep. The complexity of this setup means having to pay for a qualified team in the absence of which, your business would find itself vulnerable. Implementing data backups and redundancy procedures is complex, and can be expensive if you are setting everything up on site. Downtime is very costly to your business, so mitigating its impact is a great concern. You’ll need space to store large, expensive equipment and stringent redundancy procedures. Cloud: Delegating the maintenance of your installation to a cloud provider takes a good deal of stress off of your business. First, you no longer need to employ a full-time IT team. Since the servers your business uses to operate belongs to a third party, they will take care of the upkeep. These providers handle a huge volume of data. Therefore, they must deliver a higher quality of redundancy protection and disaster recovery. Downtime is less frequent for a cloud-based setup, and is fixed more quickly in case of a problem. Many providers boast a 99%+ percentage of uptime on their service level agreements upon signing up. On top of this, you can use their services to back up not just your communications data, but also your whole business’ operating systems, patches, programs, and more. On premises: This is another area in which you would think that onsite installations would rule supreme. If your servers and data are all stored safely onsite, sure they cannot be meddled with, right? Surprisingly, an overwhelming amount of data breaches are due to human error or intentional malice, which your business is more susceptible to with an onsite infrastructure. Cloud: Because many people have a nebulous conception of the cloud, the latter has a reputation for compromising data security. However, that is not the case. Cloud providers make it their business to stay ahead of security threats. Much as their downtime redundancy safeguards are superior to what an onsite IT team can provide, so are their security measures. Cloud computing boosts your security in a way that you will never be able to afford, because of the economies of scale. Due to the volume of data which they handle, cloud providers are able be more vigilant and efficient than a small IT team. On premises: Accumulating, replacing, and discarding hardware is not eco-friendly by any stretch of the imagination. Likewise, the lack of mobility of on premises setups for agents themselves means keeping a supply of office furniture. Cloud: Dematerializing your call center is a big step. Without infrastructure or equipment of your own, your business and others use the mutualized resources of the cloud, thereby lessening their impact on the earth. Though the move to a completely virtual call center is certainly not for everyone, adopting cloud-based call center software means taking small steps towards a greener operation. 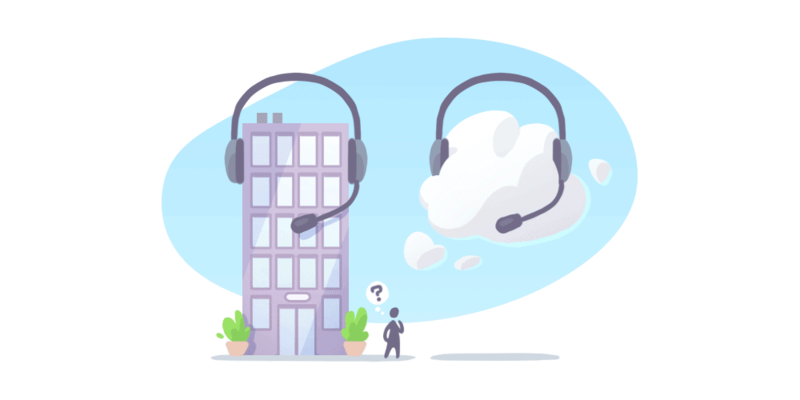 Hopefully this comparison of on premises vs. cloud-based call center software was able to highlight the merits and limitations of both solutions. The important part of setting up your call center is picking the software which best suits your needs and activity. If you find that the latter is right for you, the next step is learning how to implement cloud-based call center software and make the switch in the smoothest way possible.